There are many reasons why taxpayers fail to file required tax returns, but whatever the reason, not filing can be a very serious matter. You need a tax consultant. The IRS may construe your failure to file tax returns as tax evasion — a criminal act punishable by a prison sentence for each year a return is not filed. Where do you turn for IRS tax help? Needless to say, it’s one thing to owe the IRS money but quite another to potentially lose your freedom for failure to file a tax return. If you have been contacted by the IRS or your state’s Department of Taxation, or have received tax liens, levies or notices of IRS intention to do so, contact us for a free confidential initial half-hour tax consultation. The Schlichting Group has over 23 years of experience helping people in your position. 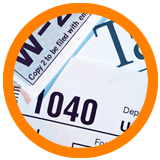 When people want tax relief coming from professionals, they seek the services of The Schlichting Group.